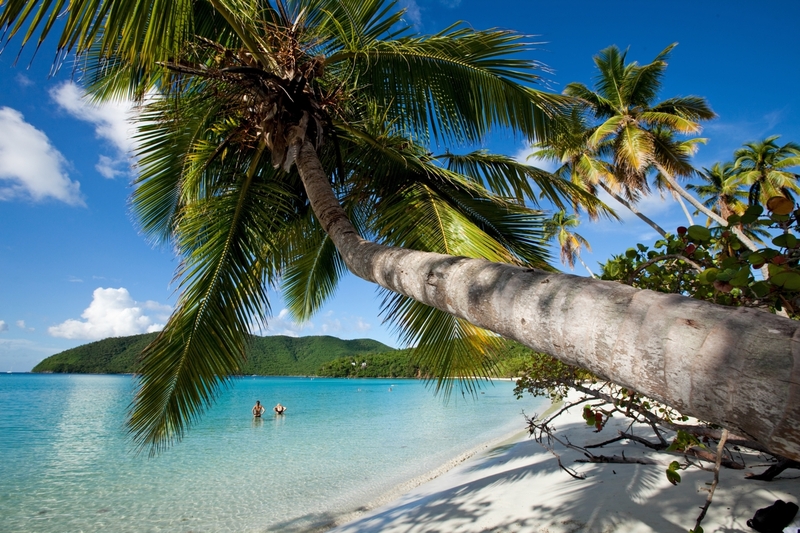 What is Crowdfund St. John? Crowdfund St. John is part of Solarize St. John, an effort to expand solar access to all St. Jonians. Too often, nonprofit organizations and low-income families experience a high electricity burden and can not afford the upfront cost of solar energy or take advantage of valuable tax incentives. Public programs that help support nonprofit organizations and low-income families join the solar movement are lacking or non-existent. 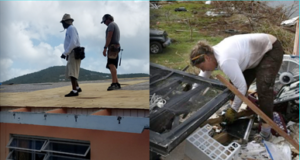 To remedy this, Solarize St. John has started this crowdfunding campaign to raise funds to buy down the cost of solar for nonprofit organizations and low-income families in St. John. 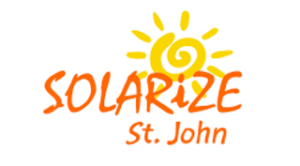 Solarize St. John is a comprehensive grassroots initiative to strategically expand the penetration and breadth of solar and battery installations across all property types and demographic profiles on the island. Electricity burden in the USVI is among the highest in the United States. Energy burden, energy insecurity, energy poverty are among the terms used to describe an ongoing problem in the United States and US Territories. The average amount of household income spent on electricity is 2.5%. In the USVI, average household income is lower than on the mainland while the cost of electricity can be up to four times higher. This means low-income families in the USVI are spending much more of their annual income on electricity than the national average and therefore have a higher electricity burden. Using solar energy to generate your own energy on your own property can greatly reduce the electricity burden for nonprofit and low-income families while simultaneously make them more resilient to increasingly powerful weather events common in the region. Combined with the Solarize St. John campaign, we can reduce the cost of solar and help make your donation go even further. A donation of $100,000 has already been made to seed this effort! Your donation will go to a nonprofit organization that will administer the funds to deserving nonprofit and low-income families. Where did a fundraising goal of $350,000 come from? Our goal is to buy down 50% of the cost of solar for nonprofit organizations and low-income families in St. John. 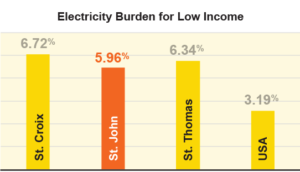 Here’s how we got to a $350,000 goal: For Low-Income households, the cost of electricity on St. John can be 4x higher than in the US, St. Jonians use half as much energy as the average American. Therefore, a small solar energy system can have a major impact on electricity burden. For example, just a 2.0kW solar energy system (approximately 7-9 solar panels) can offset 70% of the average home’s electricity usage on St. John. A 2.0kW solar energy system costs approximately $7,000 (before 30% tax credit) so our goal is to grant, on average, $3,500 to low-income and medium-income families in St. John to offset 70% of their energy burden. In addition, your donation will go to help nonprofit organizations on St. John to help reduce their energy burden. Money saved on the organization’s electricity bill will go toward mission related activities. What happens if we don’t make our goal? If we don’t make our goal, we will make as many grants as possible under the above described methodology. If we exceed our goal then we will make more grants to more low-income families on St. John to help reduce their energy burden. Why do you only grant 50% of the cost of installation? Solar energy systems are long-term investments so it’s important that the recipient of the grant understand what they are signing up for. Fortunately, solar requires very little operating and maintenance and performance can be monitored with a computer or smart phone. At a grant amount of 50%, even If the homeowner needs a loan for the remaining 50%, their monthly savings on the cost of electricity will exceed the monthly payment on the loan and the homeowner will be cash-flow positive from day one. If the homeowner is able to use the 30% tax credit plus a 50% grant, the payback on their investment is approximately 2 years. Then the homeowner will enjoy free, clean energy for decades to come. Where does my donation go? All funds raised go to a St. John nonprofit organization to administer and will be used to help buy down the cost of solar for nonprofit organizations and low-income households. The administrative nonprofit organization will ensure these contributed funds will be provided via screening and qualifying to targeted recipients who could not afford a system otherwise. To get started, select one of the prescribed funding levels and become part of a movement to make solar energy more affordable for ALL St. Jonians. If you wish to make a donation in an amount different than one of the levels here, please contact us at admin@solarizestj.com for more information. A crowdfunding campaign to help buy down the cost of solar and reduce the energy burden for nonprofit organizations and low-income families in St. John.